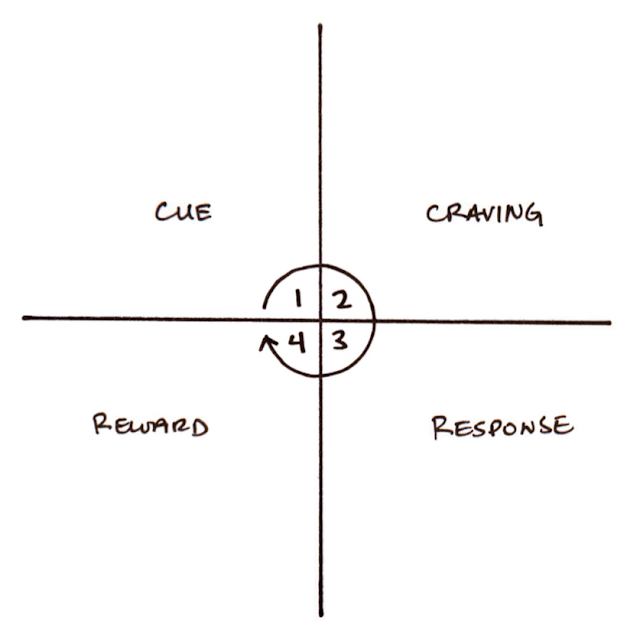 According to James Clear, the author of Atomic Habits, there are four-step loop that underlies our behaviour: cue, craving, response, and reward. When this loop is repeated, it can form new habits in our life. To build or break habits we need to modify each step of the habit loop. This blog post is more or less summary of Atomic Habits. 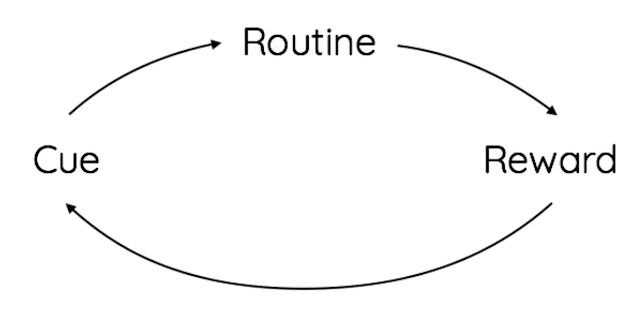 James' work was actually heavily influenced by Charles Duhigg's The Power of Habit, which uses three-step loop: cue, routine, reward. Both James and Charles are great author. Charless' framework is simpler, but James' explanation is more systematic. The key to building lasting good habits is focusing on creating a new identity first. Our current behaviors are simply a reflection of our current identity. Start with changing the identity (what we believe we are), then changing the process (what we do), then changing the outcome (what we get). Good habits will bring positive compounding for our life especially in productivity, knowledge, and relationship. To build good habits we need to emphasize all four steps in habit loop in a positive way. In the other hand, bad habits will bring negative compounding such as stress, negative thoughts, and outrage. To break a bad habit we need to emphasize those four steps in a negative way. Be aware about our habits, write them down. Identify the cues of our habits, which are usually related with the context of time and location. Use implementation intention: "I will [do new behaviour] at [time] in [location]." Moreover, use habit stacking: "After [current habit], I will [do new habit]." Examples: I will exercise for half hour at 8pm in my apartment's fitness center. After I pour my cup of coffee each morning, I will meditate for one minute. When I buy a new item, I will give something away. Motivation is overrated. Design your environment so the cues of good habits are standing out, visible, and obvious. Sometimes it's easier to build new habits in a new environment because you are not fighting against old cues. Example: If I want to drink more water, fill up a few water bottles each morning and place them in common locations around the apartment. Habit is a dopamine-driven feedback loop. When dopamine rises (we feel it more attractive), so does our motivation to act. 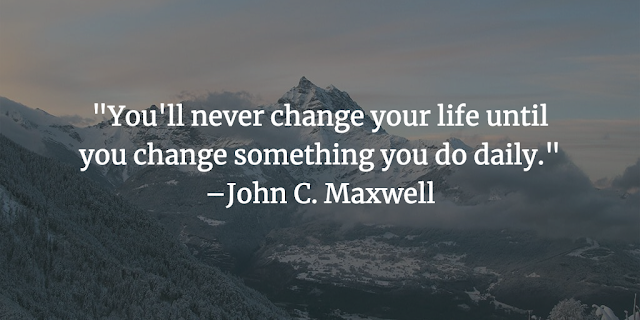 Pair an action you want to do with an action you need to do. We tend to imitate the habits of three social groups: the close (family and friends), the many (the tribe), and the powerful (those with status and prestige). Join a culture where your desired behavior is the normal behavior and you already have something in common with the group. Focus on taking action, not being in motion. Habit formation is the process by which a behavior becomes progressively more automatic through repetition. The amount of time you have been performing a habit is not as important as the number of times you have performed it. We will naturally gravitate toward the option that requires the least amount of work. Create an environment where doing the right thing is as easy as possible. Decrease the number of steps between you and your good habits. Prepare your environment to make future actions easier. Examples: Want to exercise? Set out your workout clothes, shoes, gym bag, and water bottle ahead of time. Want to improve your diet? Chop up a ton of fruits and vegetables on weekends and pack them in containers, so you have easy access to healthy, ready-to-eat options during the week. When you start a new habit, it should take less than two minutes to do. Habits can be completed in a few seconds but continue to impact your behavior for minutes or hours afterward. Examples: Reading books every day starts from reading one page. Running for an hour starts from tieing your running shoes. 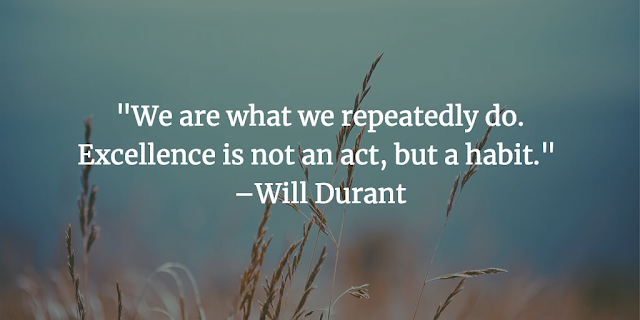 We are more likely to repeat a behavior when the experience is satisfying. The human brain evolved to prioritize immediate rewards over delayed rewards. Therefore, give yourself an immediate reward when you complete your habit. You need to feel immediately successful – even if it's in a small way. A habit needs to be enjoyable for it to last. One of the most satisfying feelings is the feeling of making progress. Use habit trackers to make your habits satisfying by providing clear evidence of your progress. Never miss twice. If you miss one day, try to get back on track as quickly as possible. Reduce exposure. Remove the cues of your bad habits from your environment. Spend less time in tempting situations since it's easier to avoid temptation than resist it. Examples: If we feel unproductive at work, leave our phone in another room. If we feel like we're not grateful enough, stop following social media accounts that trigger jealousy and envy. If we're wasting too much time playing mobile games or scrolling on social media, uninstall those apps from our phone. Reframe your mindset. Highlight the benefits of avoiding your bad habits. Habits are attractive when we associate them with positive feelings and unattractive when we associate them with negative feelings. Examples: Instead of telling yourself "I need to go run in the morning," say "It's time to build endurance and get fast." Increase friction / the number of steps between you and your bad habits. Use a commitment device to restrict your future choices to the ones that benefit you. Examples: Remove granulated sugar from your kitchen to reduce sugar consumption. Use website blocker to stop browsing social media. Turn off notifications and mute all chats to stop getting distracted. What is immediately rewarded is repeated, and what is immediately punished is avoided. We are less likely to repeat a bad habit if it is painful or unsatisfying. Get an accountability partner to watch your behavior. Knowing that someone else is watching you can be a powerful motivator. Humans experience peak motivation when working on tasks that are right on the edge of their current abilities. The greatest threat to success is not failure but boredom. As habits become routine, they become less interesting and less satisfying, we get bored. Anyone can work hard when they feel motivated. It’s the ability to keep going when work isn’t exciting that makes the difference. The upside of habits is that we can do things without thinking. The downside is that we stop paying attention to little errors. We need reflection and review to remain conscious of our performance over time.